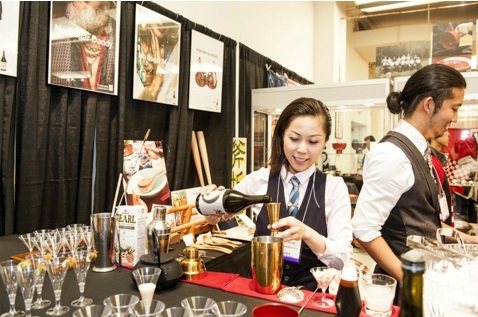 The Japan Mutual Trading Expo” hosted its 21st Annual restaurant trade show to connect chefs, vendors, and businesses from the US and Japan all in one place. 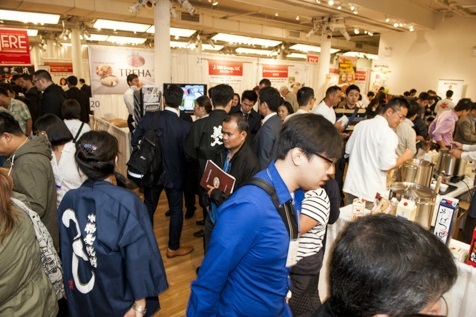 Highlighting new products and conducting seminars, the Japan Mutual Trading expo is a flavorful event with a variety of food from various regions of Japan. Companies displayed their unique recipes of ramen, miso soup, and soy sauce. There was also a variety of sakes and shochu each made from different fruits such as yuzu and plum. During the event, Imuraya held samples of their all natural mochi, made from coconut instead of the traditional sweet rice. The middle consists of a creamy flavors such as chocolate, mango, strawberry and green tea. The combinations are delicious and nutritious! http://www.imuraya-usa.com product-mochi-coconut.html. Go Yo Foods specializes in creating delectable professional deserts with 100% Japanese grown wheat, Australian made cream cheese and whole eggs from Kyushu. Go Yo Foods gave samples of their frozen cheesecake, part of their new Sweets Stock section. It’s very cold to eat at first but after the first bite, the texture becomes soft, creamy and very rich in flavor as if it were freshly made at a bakery. Go Yo Foods also has a Mount Blanc cake series, sponge cakes, and shortcakes customizable for any occasion and any season. http://goyofoods.co.jp. Maruya Hatcho Miso gave samples of their easy quick to make miso soup. Coming from Aichi Prefecture of Japan, the family has a long tradition of producing the most natural products from Japan. www.8miso.co.jp. Kewpie also had samples of its infamous mayonnaise. The mayonnaise flavor is different from the common mayo in the U.S. Their mayo blend consists of umami and different vinegars that makes gives a fresh aroma and tangy taste with a light creaminess. The kewpie company since 1919 has specialized in creating “good products from high quality ingredients”. They also have soy sauce dressing which incorporates onion, black olives and red bell pepper making it a delicious sauce that is savory and slightly spicy for salads and grilled dishes. www.kewpie.co.jp/english . Kaga Miso is a company from Kaga, a region in Ishikawa prefecture, that produces a rich and sweet miso paste with a soft texture. The miso paste is carefully made from rice and soybeans mixed with sea salt, to create an abundance of koji. Koji is a mold that grows on rice that is responsible for the paste’s sweet flavor. The company is certified USDA organic and since 2014 and JAS Organic since 2009. Their miso paste can be used for grilled dishes, soups, or can be served plain as a dip. The Kagamiso Co. is also a cooperative union established since 1971, which also include various other specialty food companies from Ishikawa. Consumers can purchase this special miso from their website and know that they are not only purchasing a healthy nutritious product, but are also benefiting the companies and its workers long tradition of miso making. http://www.ifa.or.jp/english/products/25_kagamiso.html. Apart from the sauces, there was samples of otoro tuna from Uoriki Fresh and sample bites of king crab, eel, yellowtail and salmon from various seafood specialty companies. The Saga Prefecture Genkai Fishermen’s Association gave samples of the Yobiko “Kensai” Squid. This particular squid is naturally salty and has translucent white flesh that has a firm texture, often used for sashimi. The Hokkaido Fishermen’s Association gave samples of its Hokkaido “Cooked Octopus Leg”. Octopus is common in Japanese cuisine. This particular octopus is caught off the coast of Hokkaido prefecture and cooked in a special method that preserves its tender texture, vibrant color, and natural flavor from the sea. On the upper level, Japan Mutual Trading displayed an array of professional kitchen knives, bowl sets and other cooking utensils suitable for every kind of kitchen. For the interior design of the kitchen, Okinawa’s artist Kaneko Haruhiko, creates original Ishigaki tenmoku pottery. The tenmoku pottery was known as Jian Kiln, a traditional Chinese dishware used for tea ceremonies during the Song Dynasty. Japanese monks that studied from China’s Mount Tianmu, learned the intricate art of the tea ceremony and later adopted in Japan. Tea ceremonies became part of the temple practice of Zen Buddhists monks and the tenmoku pottery was used to serve offerings to the Buddhists or Shinto gods. Artist Kaneko Haruhiko became amazed with this traditional pottery from his father, Kihachiro Kaneko, who had studied on how to make the traditional earthenware. It was Haruhiko as a child, who persuaded his father to experiment adding glass into the clay out of curiosity. His father agreed and they both discovered the unique blue color it gave. Kaneko Haruhiko and his father became pioneers in this new kind of fusion using the natural minerals and glass from Okinawa and Ryukyu islands to create their original Yoron-yaki pottery. Haruhiko Kaneko is now a professional artisan and visionary whose work ranges from bowls and cups to fine jewelry that the Empress of Japan wore during a national holiday. His artwork has also been featured in galleries at France and New York. His work “Happy Blue Wall” was designated Japanese national property by The Consulate General of Japan in Marseille and The Japanese Ministry of Foreign Affairs. To view more of his work visit his website: http://www.ishigaki-blue.com. There was also a raffle and lectures held by professional chefs to give cooking tips and this year’s main feature, how to freeze fish properly to preserve flavor and freshness, which can be a challenge for any chef. A demonstrator used a diagram to demonstrate how using a the Cells Alive System (CAS) can aid in making water droplets smaller so it creates a frost that preserves the fish without making it a ice cube. The CAS is a specialty freezer produced by ABI Corporation that uses electromagnetic fields and mechanical vibrations to limit the ice formation that destroys food texture. Several chefs cooked squid that was preserved with regular use of salt and one preserved with CAS and most of the audience agreed that the squid preserved with CAS was more flavorful with a tender texture. For more information on Japan Mutual Trading Expo or to purchase Japanese made products visit: http://www.nymtc.com.